Despite being one of the most unusual animals on the planet — their closest relatives are whales and dolphins — hippos don’t get a lot of love. They tend to be overshadowed by the continent’s other remarkable mega-mammals. Who can compete with elephants and giraffe and lion? Perhaps, that’s why it’s not exactly surprising that the announcement of a hippo cull in Zambia didn’t exactly make global news. In 2016, Zambia proposed a large-program scale cull of its hippo population, but soon rolled back the idea after backlash by environmental and animal rights groups. Now, the idea is back: Zambia has proposed a cull of 250 hippos annually for the foreseeable future. The government says there are simply too many hippos and fears an outbreak of anthrax that could spread to other animals. A South African outfitter, Umlilo Safaris, has begun advertising to the chance to kill five hippos per trophy hunter. Not surprisingly, some animal rights and conservation groups immediately cried foul. “The negative consequences for thousands of hippo and Zambia’s reputation as a wildlife tourism destination — the proposed cull site can be seen from the internationally-renowned Chichele Lodge — cannot be under-estimated,” said Will Travers, head of Born Free Foundation, last month. The pushback has put the government on the defensive. Charles Banda, Tourism Minister, has confirmed that a final decision has not been made. “The matter is under discussion in Cabinet and a decision will be announced soon,” he said. The hippo population on the Luangwa River is currently the largest in the world. The IUCN estimates that around 25,000 hippopotamus are living in the Luangwa River and notes that there may be as many as 42 hippos per square kilometer on the river at its highest density. In fact, around 20 percent of the world’s surviving hippos are found in this single river — a remarkable conservation achievement by Zambia. “Given the number of hippos in [Zambia], at a national scale, the proposed cull number seems reasonable,” Rebecca Lewison, the chair of the IUCN Hippo Group and a professor at San Diego State University, said. According to the Zambian government, one of the primary reasons for a cull is the fear of an anthrax outbreak. This is hardly unfounded as anthrax outbreaks have been seen among hippos populations in Tanzania and Namibia last year. While most of us know of anthrax as a deadly poison used to terrorize people, it is a bacteria that most commonly hits ungulates like cows, sheep and, yes, hippos. It tends to hit hippos during drought years when their river dries up. No humans were infected in either Tanzania or Namibia during the anthrax outbreaks. “The concern with anthrax is that it will spread quickly through the hippos and it does have the potential to spread to other animals, like lions, elephants and giraffe,” Kendall noted, though she added these species are less likely to be hard hit due to their different behavior and diets. “It is clear at this stage already that there is a lack of scientific research and its results when it comes to hippo management,” said a spokesperson for the The International Council for Game and Wildlife Conservation (CIC). The spokesperson for the pro-hunting not-for-profit group noted that they’d like to see more clarity on if the hippo is indeed overpopulated in this area or if declining habitat was pushing it into conflict with people. The CIC said it would support a hunt if the numbers required a cull and the animal is fully utilized, i.e. its meat is eaten. However, a 2013 paper by Chansa Chomba with the Zambia Wildlife Authority, notes that hippo meat is rarely eaten in the area due to a local belief that consuming hippo can cause leprosy. As largest land animal in the Artiodactyla order, hippos can have heavy impacts on the environment, including erosion and water quality. A large number of hippos produce a lot of feces, delivering high amounts of nitrogen and phosphorous into the river system. A paper this year found that hippo feces in the Great Ruaha River in Tanzania impacted both biodiversity and fish abundance — but only during the dry season. Still, sudden fish kills due to hippo poo are likely cyclical, natural events — though exacerbated by human use of the rivers — that have the plus-side of feeding scavengers. An abundance hippos, of course, can also lead to human-wildlife conflict, and potentially human deaths. Hippos are known to raid crops and will aggressively defend their territory, especially in the water. A common warning: never get between a grazing hippo and its water source, never cut off its escape route. Exacerbating matters, Zambia, like much of Sub Saharan Africa, has seen its human population boom in recent decades — doubling in less than 25 years — leading to greater conflict with wildlife as its territory inevitably shrinks. In February of this year, a hippo capsized the boat of two men illegally fishing in Zambia — one of them was almost immediately killed by a crocodile. And earlier this month a man in Zimbabwe was killed by a hippo in his garden. Certainly, the people who must live with any potentially dangerous animals deserve a say in how governments respond. If a cull is done, the next question however is how best to do it. Currently, the Zambia government is outsourcing the cull to trophy hunting outfits. The problem with this is that they are also outsourcing which animals are shot. Trophy hunters usually want to kill the biggest males possible. In some cases this can lead to catastrophic cascading effects, such as with lions when a male dies and its cubs are killed by rival males. But with hippos the exact opposite may happen: killing a bunch of males could actually lead to an increase in the population in coming years. Chomba, who did not respond to requests for comment, also found in his research that past culls had little impact on the population. The population on Luangwa has been relatively stable over recent decades after rising from near extermination. “I think the discussion…really centers on the pros and cons of trophy hunting,” Lewison said. She noted this depends very much on how the money from the hunt is spread out. Are local people receiving funds? Is a good chunk of the money going to pay for rangers and land protection or is it disappearing into profits and corruption? A recent article alleges that the cull really isn’t about too many hippos but about a poorly-written contract signed with hunting outfits in 2016. According to the investigative piece, the Zambian government is looking to avoid a lawsuit by Mabwe Adventures Limited for cancelling the cull last time by giving them, via Umlilo Safaris, another chance at killing hippos. Umlilo Safaris did not respond to requests for comment. Full-grown, big-toothed, grumpy hippos don’t really have predators. The one exception, according to Kendall, are some lion prides that have learned to hunt adult hippos (how have we never seen that on a nature special?). But even with these specialized prides, hippo populations are largely constrained only by their natural environment. Kendall says hippos “naturally have fluctuating populations”: when there is lots of rain and lush grazing, the population will rise, but it will plunge again during drought years. In other words, hippos populations won’t run totally amuck. Eventually, Nature — through her tools of disease or starvation — will rein-in Luangwa’s watery behemoths. “It is somewhat an ethical question: of whether it’s better to let animals die from natural causes or if you want to use human managed techniques like culling,” Kendall said. But a bigger questions keeps rising to the surface as I read about this cull: have we as a human species become a little unsettled by abundance? Natural abundance — once the mainstay of the planet — is becoming increasingly rare to witness, especially when we’re talking about anything bigger than an insect (and even those are in deep trouble). I’m not sure what Americans would do if their sky filled up with billions of passenger pigeons — as they once did — but I doubt they would like it. They’d probably push for a mass-scale extermination campaign to escape a seasonal precipitation of bird droppings. It’s even harder to accept abundance when it’s a species that’s viewed as potentially dangerous — like hippos — or a competitor. Many Europeans and Americans have shown discomfort with even the smallest populations of wolves. The minute they make their reappearance, whether in California, Iowa or Holland, someone is calling for them to be controlled, i.e. hunted. It doesn’t matter that present wolf populations are tiny fractions of their former abundance or that they play outsized roles in maintaining ecological health. The fact that they are returning is…disturbing (to some). In 1995 scientists described the way in which humans over generations have forgetten what nature really looks like: shifting baselines syndrome. First coined by fisheries scientists, Daniel Pauly, “shifting baselines syndrome” basically means that every generation sees nature through a different lens. The slate is constantly being wiped clean. Therefore, what we view as “normal” nature is actually degraded — and often degraded with every generation. Our baselines of normalcy keep shifting. In other words, a rising hippo population seem unsettling — even threatening — though a couple hundred years ago they were far more abundant. If you grew up in an area that no longer had wolves — and then they come back — they seem like invaders. How would the average Briton respond if they woke up one day and their island was covered, coast to coast, in forest, as it was not so long ago? Research has proven that humans even experience “shifting baselines” in their lifetimes : it turns out we update expectations (and biases) of nature as we age. Scientists call this personal amnesia: we forget that when we were children we used to hear frogs all the time, we used to see more species of songbird, or have more habitat along field rows. So, my question is this: Is the desire to cull a recently recovered population a part of our shifting baseline bias? Maybe. Maybe we’re trying to return nature to the way it was, even when in this case it was degraded before and is now actually recovering — just a little. Humans have long desired to harness and control nature. We are constantly trying to rein in everything nature does, a fact that underpins both our startling success and our potential demise. The American government has an entire unit, the Wildlife Service, that is devoted to killing animals it view as pests — in 2016 it killed 2.7 million animals, including nearly a million red-winged blackbirds, 76,963 coyotes and 14,654 prairie dogs. Apparently, there was just too many of them. But if the full spectrum life on Earth — and ourselves — is going to have any chance maybe we need to rethink this growing discomfort with natural abundance. 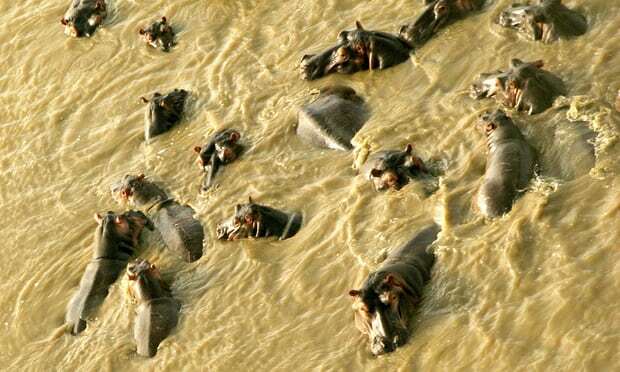 Maybe 25,000 hippos on the Luangwa River should be celebrated, instead of feared. Maybe Zambia should be congratulated on its conservation successes. And maybe we should work with the country to help minimize hippo-human conflict, instead of just chastising them at the mere mention of a cull.